2. Cut the beef and the pork into 5cm cubes and place in large bowl. 4. Mix spices with the meat cubes and allow mix to stand for 1 to 2 hours in fridge. 6. Place minced meat in large bowl. Add fat/olive oil, salt, wine and garlic puree and mix gently and thoroughly but not so that you end up with compressed meat. 7. Feed loosely into skins and shape into rolls of 500g to 1kg. 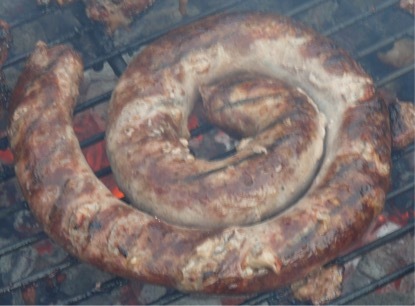 This sauasge can be grilled or fried, but it is best cooked on a barbecue.